The return of athletes making asses of themselves on twitter. It’s baaaaaaack! After a hiatus from this popular feature, we return today with Vikings Offensive Lineman Bryant McKinnie. Last week, I read a feature on McKinnie, and his behavior during the festivities at the Superbowl. Apparently McKinnie is so out of control, he was originally elected to the pro-bowl but was axed because the league was unable to get in contact with him to let him know in time! The article referenced a rather confusing relationship that the NFL star has garnered with washed up whore and ex-convict Lil Kim. The following post will leave you even more confused. bigmacvikings– Producers while I still have Lil Kim with me send me some hot tracks. We been going thru songs all day. We went thru some last nite as well. So uh is Bryant McKinnie starting a rap career and Lil Kim is producing for him? Is he producing for Lil Kim? Is he simply listening to music and completely misinterpreting what Lil Kim’s purpose for him there was? Well I know for sure he is banging her and he will have hepatitis soon…..and not the ‘good’ kind either…. McKinnie is becoming a hero of mine. Not only is he rapping and/ or producing with Lil Kim but you’ll see if you scroll further through his page, he is also attempting a tennis match vs. Venus Williams. Bryant McKinnie is proving to not only be a superior offensive lineman and partyer but a renaissance man. 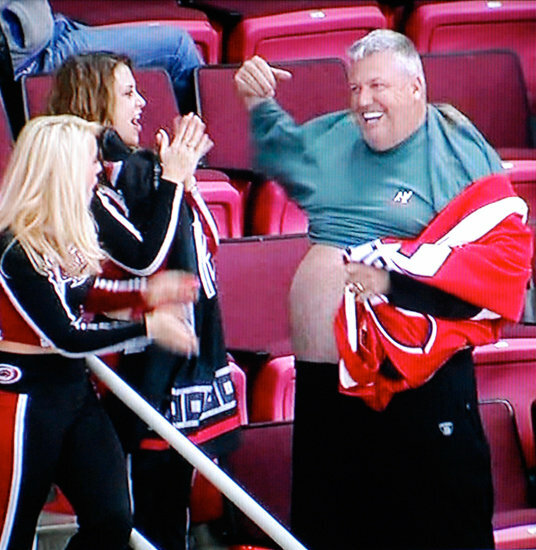 The only thing left for him to do is attend hockey games with Rex Ryan. He’s wearing a Big Dogs shirt everybody. A BIG DOGS SHIRT!